Vari-Flex Junior provides an exclusive combination of comfort and dynamics. It is specially made for those children who require the additional energy response. Vari-Flex Junior is lightweight, easy to assemble and has a slender profile which makes it easy to cosmetically cover. It ensures the highest levels of user confidence and security. Promoting a natural gait with less fatigue and strain on the lower back and sound side, it is the ideal foot for any activity. Vertical forces generated at heel contact are stored and translated into a linear motion described as Active Tibial Progression. This action reduces the need to actively push the body forward using the contralateral foot and also equalizes stride length. Benefit: More natural gait and reduced walking effort. 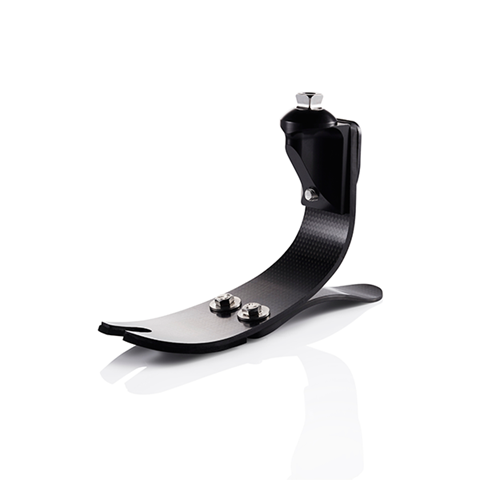 The layering of carbon fiber, optimized through extensive computer analysis and mechanical testing, ensures that the deflection of the carbon fiber heel and forefoot components are proportional to the user’s weight and impact level. Benefit: Customized construction optimizes walking efficiency thus reducing fatigue for the user.